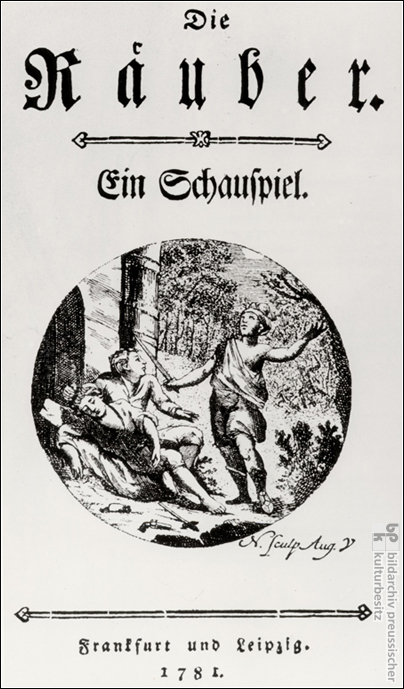 The Robbers [Die Räuber] (1781) is Johann Christoph Friedrich von Schiller’s (1759-1805) first important contribution to German drama. It is a passionate rejection of arbitrary authority and a plea for absolute liberty. A product of the rebellious creative energy of the pre-Romantic Sturm und Drang period, the play was written in bold defiance of Schiller’s tyrannical sovereign and military commander Duke Karl Eugen of Württemberg (r. 1737-93). Schiller anticipated retaliatory measures from the duke, who had not only forced him into military service and training in law, but also jailed him twice for leaving the country without princely authorization (on one occasion Schiller had left to attend the play’s debut performance). He first published the work himself (anonymously) in Stuttgart (with a false attribution of its place of printing). In 1782, he fled Stuttgart and finally settled in Jena, where he was appointed professor of history and philosophy under the rule of the Duke of Weimar. Reproduction of the title page of the first edition of The Robbers, 1781.